All the fuss this season (on the track, at least) has been over the new drivers entering F1. Lewis Hamilton has set the British media alight with his performances, Robert Kubica is living up to expectations after his excellent showing in the last races of 2006, Heikki Kovalainen at Renault is beginning to show how good he is, Sebastian Vettel wowed us at Indianapolis, and even Adrian Sutil at Spyker has been quick enough to hasten his team mate's marching orders. But what of the old guard, how are they doing? David Coulthard seems to have taken on a new lease of life at Red Bull but is usually outperformed by his team mate, Mark Webber; and Mark himself has been dogged by the unreliability of the car. Giancarlo Fisichella, while doing a solid and dependable job at Renault, has not been able to shake off his reputation as not competitive enough. Jarno Trulli does his best with a car that is inconsistent, but perhaps the less said about Ralf Schumacher, the better. The two great hopes for the season, Fernando Alonso and Kimi Raikkonen, have found things very difficult, enjoying the best cars of the season but struggling to beat their team mates. All in all, it looks an underwhelming year for the experienced drivers. Yet there is one who has shrugged off the doubts of previous seasons and staked his claim to be at least as quick as the newbies lined up against him; and that is Nick Heidfeld, of course. He has been the forgotten man of F1, twice seeing team mates he had outperformed go on to better drives than were offered to himself - Raikkonen to McLaren in 2002 and Massa, who found himself in a Ferrari from 2006. But perseverance has paid off and now Nick is in a team that suits him perfectly. With BMW's purchase of the Sauber team, the car has become seriously competitive and Nick is extracting the best from it, regularly finishing in the points and beating Kubica on most occasions. His second place in Canada was entirely deserved and the result of a race run as efficiently and mistake-free as Hamilton's. He has also had to fight for position on occasion, overtaking Alonso in Bahrain and proving impossible for Massa to pass in Malaysia. It all amounts to a driver who is seizing his best opportunity with both hands. After years of being passed over, Heidfeld is showing us just why he is known as "Quick Nick". And we have to wonder why he has not really come to our notice before. Partly that has been the result of being in the wrong place at the wrong time; although he was able to drag uncompetitive cars higher up the order than they should have been, finishing outside the top six does not make a big splash in F1. But it also has much to do with his character. Nick is not a great self publicist and prefers getting on with the job to hyping his exploits to the press. He sometimes appears sullen and withdrawn and rarely is he caught smiling by the photographers. But that is just evidence of the seriousness with which he takes his job. Nick has had an uphill struggle in F1 and it is his determination that has pulled him through to the good times. He deserves the success he is now enjoying. Is he a potential world champion? I think yes; if the BMW continues its rapid improvement next year, he will have the equipment to win races and I can see Nick quietly winning race after race. It will not be easy - the top two teams are immensely strong and employ extremely capable drivers. But Nick clearly has the talent necessary and his grit and experience could well be the deciding factor in any contest with the new stars of F1. And, whatever the future holds, he will always be able to point to 2007 and declare that he was the only member of the old guard to put the young ones in their place. Its refreshing to see articles about individual drivers and their futures. I'm just sick of reading about everything that is wrong with the sport. A pity he hasn't gotten an extension yet, at this point it would be stupid not to. Are they waiting for a reason not to keep him? Are they hoping he will get injured and make the Vettle/Kubica question a moot point? I think that's just Theissen's style, Dan. You have to remember he's German and likes everything in it's place, therefore (and that's a huge factor in BMW's improvement this season too). He's made it pretty clear that Nick has nothing to worry about - it's not contract signing time yet, that's all.When the time comes, he'll do it - it's on the agenda. As for Vettel, current thinking is that he'll be farmed out to another team for a season or two. Kubica already has his contract (although I wouldn't count 100% on that, Theissen being who he is) and looks safe therefore. This is an article on ESPN written by a NASCAR journalist addressed to Bernie about the loss of the USGP. He needs to at least get his facts straight about the 2002 USGP. He thinks its something that Ferrari meant to do when in reality it backfired right in their face. Actually, I think that's a pretty fair article, Dan. The guy obviously doesn't think much of F1 but he gives it its due. And that's rare amongst most members of the non-specialist press. I'm a big fan of Nick too, and have always considered him one of the best drivers in F1. His defensive driving and overtaking are as good as anything on the grid. Having said all that, I would respectfully suggest that - despite his nickname - he does not quite have the pace to be considered a potential WDC, unless BMW pull out a really big performance advantage over the other teams next year. Alonso and Raikkonen are quicker. I don't think there is much doubt about this. On the evidence of this season, emerging young guns Hamilton and Kubica (and possibly Rosberg) also have more natural speed. Of course they need more experience, but once they have added the craft, I fear Nick won't be able to live with them. In the same car you'd back all the above named drivers to qualify above Nick on Saturday. Unlike Webber, you woudn't back them to go backwards on Sunday. This lack of ultimate pace makes Nick a long shot for the championship. For him to win, the BMW must first have a big performance / reliability advantage over Ferrari and McLaren. Secondly, Nick would need to get the better of Kubica. I think that even by the end of this season Kubica will have more points / the upper hand in their head to head. Nest season it is not likely to be close, as Kubica is still learning. I may be wrong, but I don't think Nick's bad back is the reason for the pretty significant gap Kubica has opened up since he came back from his accident. If the trend continues, Robert is the one more likely to take advantage, should BMW deliver a winning car next season. That's a carefully considered assessment, Ken, and I hesitate to argue with it. But there are factors in Nick's favor too. Let us not forget that he was quicker than Raikkonen when they both in the Sauber team (perhaps not as spectacular, I'll admit). And we have yet to see whether Kubica really does press home his current advantage over Nick. I have the feeling that he won't. Last year I had my doubts about Heidfeld, feeling that, if he had to have a spur to his endeavors such as the sudden arrival of a quick team mate, his commitment must be lacking. But this season has made me think that what really happened was that the BMW just happened to get a lot better at the same instant that Villeneuve departed. Nick has demonstrated good pace this year, leading me to suspect that his previous problems have been much more to do with the shortcomings of the cars he has driven, rather than a lack of talent in the man. I find myself liking him as a person now and, darn it, I hope he gets the better of Kubica in the long run! So yes, it's not purely a logical assessment on my part but then little in F1 is. I could be wrong but I think Nick will win. Thanks Clive, that's the great thing about F1 - and sport in general: it *is* illogical and uncertain, and not all competitor outputs (I love McLaren so much I fear I'm beginning to slip into terminal Ronspeak) are capable of rational explanation. To illustrate, I have always had this gut feeling that my all-time favourite driver, Mika Hakkinen, could have matched and perhaps even beaten the great Michael Schumacher, had they ever been paired in the same team with equal equipment in their prime. Now, on the strength of their comparative performance against teammates over the course of their careers, performances in uncompetitive cars, wet weather results, poles, race wins, and numerous other statistics, I would agree that my view *seems* illogical and counter-intuitive: MS was superior to the Flying Finn as all-round racing driver (sniff). In fact, even in terms of one-lap qualifying speed, the one area in which many impartial F1 fans (and not MH fanatics like myself) would give Mika the edge, I am more cautious and would argue they were just about equal. So, whither my confidence? I don't know, but all I do know is that around the late 90s I was hoping against hope that they would one day be matched and the myth that Mika was just another JV, who just happened to get lucky - albeit twice - in the best car on the grid would once and for all be dispelled. Sadly it never happened, so we'll never know, but I remain convinced that (assuming roughly equal treatment) Mika had the tools to beat Michael in the same car over a full season. Apologies for the long digression - it was just to reassure you that I know where you're coming from with regard to Nick, respect your gut feeling about this excellent racer, and look forward to his proving me wrong over the rest of the season! PS Do you know where I could get a quick online overview of Sauber's 2002 season? I would like to compare respective performances of Nick and Kimi in the light of your words. My impression was that Kimi was the quicker but more mistake-prone on account of his rawness. On the strength of this (possibly mistaken) impression, I would have said your "outperformed" description is a bit too emphatic; perhaps "shaded" would have been better - but I am happy to stand corrected! Digression is the spice of life Ken - and the lifeblood of blogs! It's in conversations that go where they please that we discover new things. I agree that Mika was one of the great drivers of previous years and, in fact, Michael Schumacher has declared in the past that Mika was the strongest competition he ever had. Not being a fan of MS, I supported anyone who could take the fight to him and many were the times when I groaned as Mika's car went bang just when he was in the lead. You are quite right to feel that I may have overstepped the mark in saying that Heidfeld outperformed Raikkonen at Sauber (the year was 2001, by the way - a small confusion induced by my mention that Kimi went to McLaren in 2002). The bare statistics indicate that Nick finished the year with 12 points to Kimi's 9 and that their retirements numbered six to seven respectively - close enough to make little difference. Nick made the podium once, in Brazil, whereas Kimi's best result was a fourth. There was not much in but I think you could indeed say that Nick "shaded" Raikkonen that year. 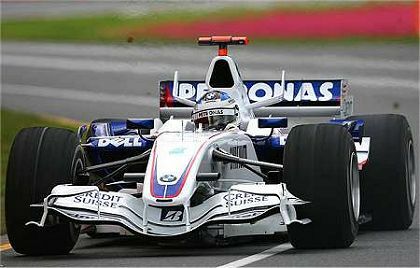 And most observers (not all, I admit) were surprised when Ron went for the Finn rather than Nick to join McLaren in 2002. Certainly Nick was a bit miffed at the time! Probably the best quick and dirty source for details of the season is the Wikipedia - this is Kimi's page and this Heidfeld's. Other sites tend to be very focused on the stats and there are at least brief accounts of both careers in the Wikipedia entries. It should be noted that in the last two races it was reported that Nick did have a back injury. Weather this was the cause for his lack of pace is unknown but he certainly wasn't on the same pace that he was at the beginning of the year. I think this is over shadowed by Kubica who had an accident that looked worse then it was. Back injuries can be very resistant to proper healing and have considerable effect on a driver's ability to function at maximum level. It is also one area that receives a lot of pounding in motor racing because the cars are set up with such stiff suspension and so transmit a lot of the impact with even minor bumps straight to the driver's spine. Nick Heidfeld is one of the few drivers I've been completely and utterly wrong about. After his first season in F1, I thought he was going to be just another statistic in the books - one of the F3000 talents who never quite translates their skills to F1. In fact, I remember thinking early in 2001 that he wouldn't be much use in, say, a Jordan... Let's just say that after 2004, I revised my opinion of him a lot! Nick is a very smooth driver, which suits the 2007 cars nicely. The BMW fight is going to be very interesting, but I think Nick will beat Kubica, that the current driver line-up will be retained into 2008 (with Vettel off to STR). Nick will win races plural, but the championship is realistically out of his reach. A pretty accurate assessment, Alianora, and I agree with everything you've said, except that I feel he could be champion if the BMW becomes seriously competitive - and that means able to beat Ferraris and McLarens. I expected Nick to be really good when he first broke into F1 and, like you was a bit disappointed. He seemed to fade into the background and never made a mark. But this year he has convinced me that he still has what it takes and I hope he gets the equipment to prove it to everyone.